The Rick Steves Best of Italy tour is exactly that — the very best. Starting on beautiful Lake Como, this tour treats you to Italy's must-see destinations: timeless Venice, Renaissance Florence, Eternal Rome, and St. Francis' Assisi. You'll also soak in Italy's quieter side: hill town vineyards, mountain-ringed Alpine meadows, cliff-clinging Cinque Terre villages, and cozy fishing harbors — all accompanied by memorable meals and local wines. And Rick's guides will make Italy's art, history, and dolce vita come vividly to life. We flew into Milan and toured the town on our own a few days. Then we took the train to Varenna on Lake Como to formally start our Rick Steves tour with our guide, Lisa Anderson. She was excellent; very organized, helpful to a fault, and took us to a lot of out-of-way places not on the itinerary. What I liked most was the mixture of planned activities and time our own own; a nice balance which I believe gave us a good feel for the people, culture, and historical places we toured throughout Italy. You can read any itinerary for this trip and learn about what you're going to see, but getting to know your traveling companions (there were 28 of us) well, share food (and a cold- achoo!) made it all the better. I would highly recommend this tour to anyone who would really like to get a taste of Italy from Rome north. I had no interest in visiting Italy before, but would go back in a heartbeat. I especially enjoyed our time high up in a ski village in the Dolomite Mountains. Seeing the "big three" of Venice, Florence, and Rome was great, but I also enjoyed seeing Pisa and Assisi, and spending time in places I had never heard of before - Cinque Terre , Siena, and Orvieto. While I know you can't pick your tour hosts, I would give the highest marks to our guide Lisa, her assistant, Alex, and our bus driver extraordinaire, Adrian. They helped put an excellent adventure over the top. Kudos to you Rick Steve's! We'll book another one of your tours in the next few years. We went on the My Way Best of Euope 14 day tour last month. Excellent tour. So much to see!!! We loved it!! I would highly recommend it if you are an independent traveler who doesn't want any stress. My first, and definitely not last, Rick Steves tour. Our guide was spectacular and the lodging nice at every location. I was blown away with how good the food was at every group meal. The sleepy Lake Como village of Varenna is a quick, easy train connection from Milan. At 5 p.m. you'll meet your guide and fellow tour members at our hotel for a get-acquainted session. We'll then take a village orientation walk, pointing out places for dinner on your own tonight. Sleep in Varenna (2 nights). No bus. Walking: light. Equipped with your included Lake Como ferry boat pass, you'll have the entire day and evening free to explore the villages and waterways of romantic Lake Como, including the elegant town of Bellagio. Or hike up into the Alpine foothills for unforgettable vistas. At breakfast, your guide can help you plan your day. No bus. Walking: light to strenuous (your choice). Today we'll hit the road and drive high into Italy's Dolomite Alps, where locals speak German first, Italian second. Our destination is Europe's largest (and arguably most beautiful) Alpine meadow, the Alpe di Siusi. This evening, we'll share a hearty Tirolean dinner together at our mountain retreat. Sleep peacefully in the Alpe di Siusi area (2 nights). Bus: 6 hrs. Walking: moderate. From your totally yodely home base, you'll have all day to explore the dramatic Dolomites, Italy's hiking and skiing mecca. Choose from an array of challenging hikes, join your guide (weather permitting) — and the free-roaming cows — for a peaceful walk among towering granite cliffs, or wander through the squares and side streets of a mountain village and enjoy the unique blend of Italian and Austrian cultures. We'll regroup tonight for dinner at our cozy hotel. No bus. Walking: light to strenuous (your choice). We'll head downhill from the Dolomites with a stop in Bolzano to visit its most famous resident: the 5,300-year-old, naturally preserved remains of Ötzi the Iceman, along with a museum exhibit on prehistoric European life. After some free time for lunch, we'll set a course for Venice, where we'll board a vaporetto boat for a Grand Canal ride to our hotel in Venice's historic heart. Tonight we'll take an alleys-and-canals orientation stroll before setting you loose for dinner on your own. Sleep in Venice (2 nights). Boat: ½ hr. Bus: 5 hrs. Walking: light. Our local guide will join us this morning for a historical walking tour, with a modern Venetian's-eye view, through the backstreets of Venice. Along the way, we'll learn about the city's remarkable past and its challenging future. We'll finish our morning walk in St. Mark's Square and Basilica. The afternoon and evening are yours to explore the imposing Doge's Palace, maybe take in a church concert, waltz on St. Mark's Square, or pub-crawl your way through this unique city. Later tonight, your guide will help organize an optional romantic gondola ride for those who are interested. No bus. Walking: moderate. We'll drive straight to Florence this morning, and hit the ground walking with a Renaissance tour of the city's historic center. We'll see and learn about Brunelleschi's magnificent cathedral dome, Ghiberti's Baptistery doors, and other creations that helped define this world-changing era. We'll end our walk at the Accademia Gallery to marvel at works of sculptural genius: Michelangelo's rough-hewn Prisoners and his greatest masterpiece, David. Sleep in Florence (2 nights). Boat: ½ hr. Bus: 4 hrs. Walking: moderate. This morning we'll devote our time to the breathtaking Renaissance art of the Uffizi — home to the finest collection of Italian paintings anywhere — including works by Leonardo, Botticelli, Michelangelo and more. The rest of the day is yours to stroll across the delightfully medieval Ponte Vecchio, visit more of the city's art-filled churches and museums, browse the colorful markets, and find a special trattoria for dinner on your own. No bus. Walking: moderate. You'll take a "vacation from your vacation" today in our Mediterranean getaway. Hike along the trails, taking in lots of fresh air and panoramic views between Cinque Terre villages. Or pick a village where you can spend your day exploring the stairways and alleyways, sunning yourself on the rocks, or sipping cappuccino and catching up on your journal at an outdoor café. No bus. Walking: light to strenuous (your choice). Today we'll venture into the heart of magical Tuscany, stopping on the way to poke around the quiet lanes of a friendly hill town. Saving the best for last, we'll take an orientation tour of our home for the next two nights — remarkable Siena — a "living museum" brimming with some of Italy's finest Gothic architecture and perhaps its best public square, Il Campo. Tonight we'll visit and enjoy dinner at one of the town's proud contrade — 17 neighborhoods that compete for glory in the famous Palio horse races. Sleep in Siena (2 nights). Train: ¼ hr. Bus: 4 hrs. Walking: strenuous. This morning we'll visit a stained-glass workshop where a local artisan will show us how he fuses traditional and contemporary stained-glass techniques. Then we'll tour the elaborate cathedral and learn how Siena's rich medieval history and rivalry with Florence shaped this city. You'll be well oriented for your free afternoon and evening to enjoy Siena, from its dramatic city hall tower to its well-respected enoteca (wine bar/museum). No bus. Walking: moderate. Let's make a modern-day pilgrimage to the hill town of Assisi where, in a time of unprecedented church wealth, St. Francis inspired a refocused spirituality through poverty, humility, and the beauty of nature in Umbria. As we learn about the life of the saint, we'll take a walking tour of the town and its beautifully frescoed Basilica of St. Francis. Then we'll wind our way across Umbria to our agriturismo destination: a country hotel that is also a working family winery. We'll end our day amid the peaceful vines and olive groves, tasting several of our host's award-winning wines, and sharing a country-style dinner together. Sleep near Orvieto (2 nights). Bus: 4 hrs. Walking: moderate. 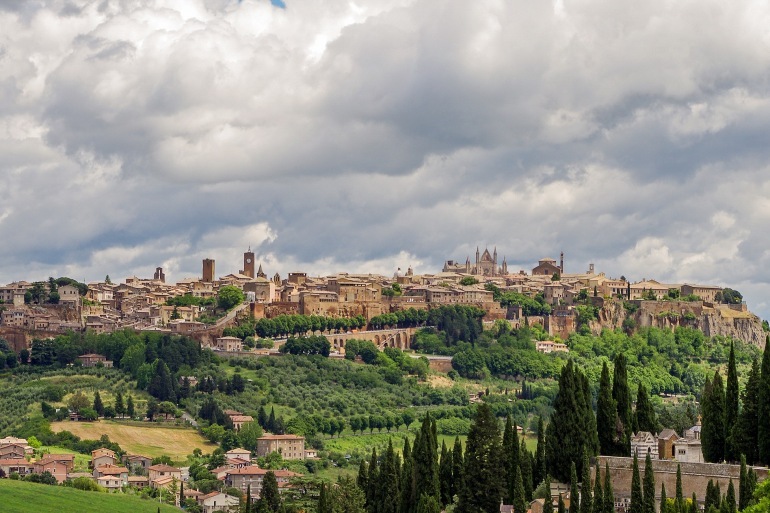 This morning we'll visit Umbria's grand hill town of Orvieto. We'll get oriented to sights around the cathedral square, including Signorelli's amazing frescoes in the Chapel of San Brizio and Italy's liveliest cathedral facade. Then you'll be free to wander through the medieval old town and its shops filled with colorful pottery. This afternoon we'll return to our agriturismo, with plenty of time for a countryside walk before dinner together. Bus: 1 hr. Walking: moderate. We'll drive straight to Rome today and spend the afternoon uncovering the heart of the Eternal City. A local guide will take us through the larger-than-life Colosseum; the birthplace of Ancient Rome, the Roman Forum; and the awe-inspiring Pantheon. This evening we'll enjoy a floodlit, fountain-splashing, dolce vita stroll, soaking up the city's evening ambience at the lively campos and classy piazzas. Sleep in Rome (2 nights). Bus: 2 hrs. Walking: strenuous. Today we'll focus on Renaissance (Catholic) Rome. At the sprawling Vatican Museums we'll visit what seems like a limitless collection of treasures as you make your way to one of the world's most famous works of art: Michelangelo's Sistine Chapel. You'll have the rest of your day free to continue your modern day pilgrimage at the greatest church in Christendom, St. Peter's Basilica, home to Michelangelo's sublime Pietà. Wander through this immense church, climb the dome if you're feeling energetic, and explore more of the Eternal City on your own. This evening, we'll have our final dinner together, sharing memories and toasting our newly made friends. Salute! No bus. Walking: strenuous. Breakfast is provided, but there are no group activities today. It's a breeze to reach Rome's airports by taxi or train. Your guide will help you with any post-tour planning, leaving you well prepared for the road ahead. Grazie e ciao! Fine print: You are responsible for the cost of your drinks and free-time sightseeing. See our Tour Conditions Agreement for important details regarding everything listed above. If you arrive in Italy before your tour begins, visiting Milan is a logical choice as we don't spend any time there during the tour. Use the Rick Steves Italy guidebook to get oriented. Ride the public transportation, try out a few words of Italian and get over your jet lag with lots of fresh air and exercise. Here are suggestions for sightseeing in Milan: Leonardo da Vinci's Last Supper (reserve from home; details in the Rick Steves Italy guidebook) and Europe's third-largest cathedral, the Duomo. Milan is about an hour by train from Varenna, our tour's departure point, making it an easy pre-tour day trip. The tour includes a Lake Como ferry pass on Day 2, allowing you to explore the many pleasant towns, such as Menaggio and Bellagio. But if you want more time to explore or hike, you may also want to cruise the lake before the tour begins. Spending extra time after the tour in Rome? Here are a few suggestions for sightseeing that we do not do as a group: Borghese Gallery (reservations required), Spanish Steps, Capuchin Crypt, National Museum of Rome, Ancient Appian Way (great for biking), and catacombs. This is a very active tour! Most days are moderate to strenuously paced with 2–8 miles of walking, including hilly terrain and lots of stairs.